If so, then you’ve come to the right place to find answers to all of your new dog questions. New dog owners are faced with a bunch of uncertainties. Especially after you get past that initial “Oh, he’s so cute” phase. Then, reality sets in. 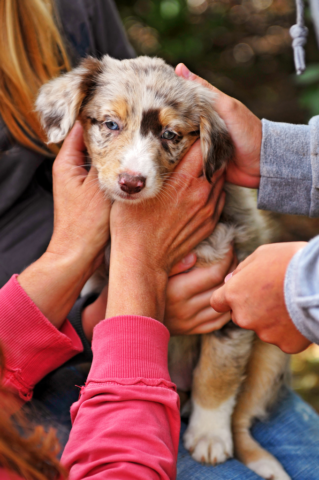 Rest assured, basic puppy care isn’t something that comes naturally for anyone. We learn helpful tips from others who’ve been successful at raising and training dogs. And for the rest… well, we just learn as we go. So, if you have some questions about dog care and what to expect, you’re definitely not alone! Follow these tips for new dog owners, so you’ll know what to do and have a better idea of what to expect… even before you bring your new dog home. It’s important to think of your new dog as a full-fledged member of the family. You’re entering into a whole new relationship with a living, breathing, very needy, and very loving animal. Your dog will depend on you for everything for the rest of his life. And if your new dog is just a puppy, then you’re in for some especially trying times until he’s properly trained to co-exist in a home with people (and rules), instead of roaming freely with other dogs. So before you bring your new dog home, just make sure that you are 100% ready and that you have enough time and resources to devote to your dog’s needs and your new relationship together. It’s a lifelong commitment to your dog with the following daily requirements: feedings and walks, toys and playtime, basic training and grooming, in addition to caring for your dog’s shelter and safety needs. True cost of dog ownership – see what it really costs to have a dog. Before you get a dog… – things to think about when it comes to dog ownership. Adopting a shelter dog – how to find dog adoption facilities & animal shelters near you. Finding a reputable dog breeder – here are the questions you should ask. Cesar Milan DVDs – these are a must-see before you bring a new dog home; tips on choosing the right dog. Basic dog supplies you need – how to prepare for your puppy’s first days at home. The breed of dog you get isn’t as important as finding a dog whose temperament and personality matches your own. In fact, the Muttigree is one of the most popular dog breeds of all, right now! That’s right, mutts are the new black, and it’s socially respected to adopt a shelter dog rather than a purebreed or a pet store dog these days. While many think that hybrid dogs with fancy names and tiny teacup dogs are cute, so are senior dogs and rescue dogs. The point is: just know what you’re getting into regardless of which breed of dog you choose to spend your life with. Choosing a dog breed – what to look for; see which types of dogs best fit your personality and lifestyle. Dog breeds 101 – the difference between purebred, mixed breed, and hybrid dogs. Mixed breed names for hybrid dogs – find the unique hybrid breed name for your mixed breed dog. Pros and cons of Teacup Chihuahuas – small, teacup puppies are very popular; see if one is right for you. Which dogs don’t bark? – which dog breeds tend to bark a lot & which dog breeds that don’t bark much at all. How to introduce your dog to your baby – if you’ve got kids, you’ll appreciate these tips! Unique dog names – how to find the best name for your puppy; top male dog names & top female dog names. How to make your dog’s world safer – 10 things you must do right away, inside and outside of your home. How to puppy-proof your home – common household dangers that dogs can encounter within your home. How to dog-proof your yard – things in your yard that could harm your dog. Socializing your dog – see why it’s so important that your dog spends time around other people and dogs. If you’re like most people, a new dog means you now have lots of dog questions. This is especially true if you rescued a mixed breed dog or you adopted an older dog — both are situations where you will know very little about your dog’s heritage and health, among other things. Your first step (possibly even before introducing your dog to his new home) should be to take your dog to the vet. Veterinarians are a wealth of information! They can give you a good idea of your dog’s true breed (or breeds), his current health (and any vaccinations that may be required for his age), the potential for future health issues (based on his genetic makeup), and — best of all — a slew of other tips personalized just for your dog! That’s right, the vet will help to fill in all of the gaps for you on things that you couldn’t possibly know about your new dog — including how to raise a dog like yours and some idea of what you can expect for his future in terms of adult size and projected lifespan. This type of firsthand knowledge and advice is invaluable. Dog DNA test – this test can identify your mixed breed dog’s genetics; your dog’s mother and father. How smart is your dog? – try these 5-minute tests to see how your dog compares to other dogs. 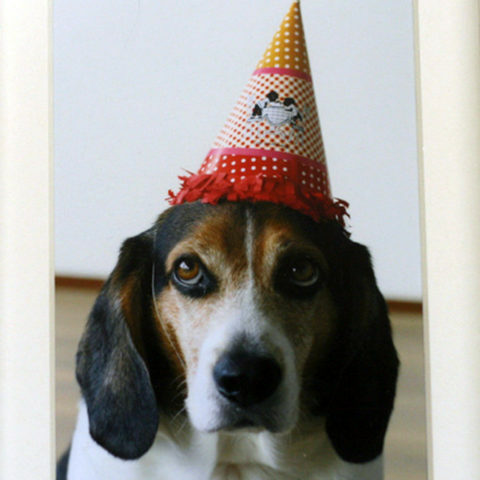 Dog age calculator – see how old your dog is, in human years; don’t just multiply by 7! Got a dog with black spots on tongue? – it doesn’t mean that he’s part Chow. Should you remove dog dew claws? – tips for dealing with dew claws, if your dog has this extra toe & nail. If you have an older dog, then some things may seem easier while other things may seem like more of a challenge. The fact is senior dogs can be just as easy to train as younger dogs, and even easier to train than most puppies! It all depends on your dog’s temperament and life experiences up until now, as well as your own personality, patience, and consistency when training your dog. Housebreaking an older dog – 5 tips that work! Senior dog food – see what you should be feeding older dogs. Health care for older dogs – how to tell when your dog is in pain; addressing the health needs of an older dog. Living with an old, deaf, and blind dog – advice from someone who’s been there, done that. Senior dog care – if your dog is getting old, follow these daily dog care tips for seniors. More tips for new dog owners!